"Their hearts were all cycling through the same madness—the discovery, the bliss, the loss, the despair—like planets taking turns in orbit around the sun. Each containing their own unique gravity. Their own force of attractions. Drawing near and holding fast to whatever entered their own atmosphere . . . they would find love and lose love and recover from love and love again." This was a thoroughly enjoyable book, containing all the essentials for a strong 4 star rating: lyrical writing, well-developed characters, and an engaging plot. The book's plot structure was unique too. 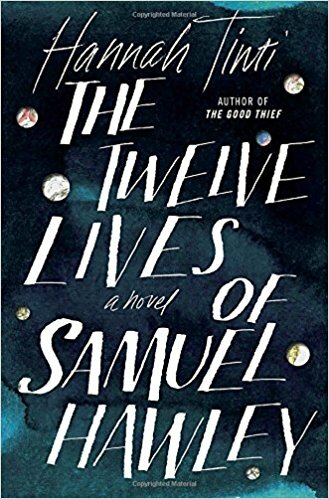 The story jumps back and forth between the present with Samuel Hawley and his teen daughter, Loo, to the past with explanations of how Samuel—previously engaged in criminal activity—received his twelve bullet wounds. What fascinated me about this book was getting into the head of someone who had broken the law and his fight for a relatively normal life and his family. What's it like to run from the law, to always be looking over your shoulder? This book gave me a taste of that. But this book is much more. It explores what happens when a criminal finds love, through a woman who walks into his life one day and their child, Loo. How far will one man go to protect those he loves and to secure a safe, happy life for them? Overall, it was a really fun and beautiful read, showing the power of love and family despite hardships and past demons trying to squelch it.